People always seek reasons to explain everything that happens around them. Often times the judgements that we make about particular situation turns out to be completely unrelated to the event. When Toronto existing home sales unexpectedly declined this past January, some folks (like RBC) attributed the slowdown to bad weather. A few weeks back I questioned this attribution in the comments section. As it turned out, I was right to challenge the weather assumption. If weather was indeed the main driver behind the slowdown in existing sales this past month, then how do you explain the fact that new home sales in Toronto increased by 74% in January 2014 vs a year earlier? 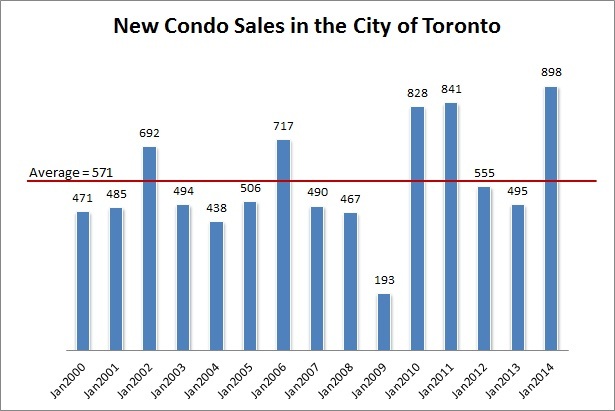 New condo sales were up 69% in the GTA and 81% in the City of Toronto. 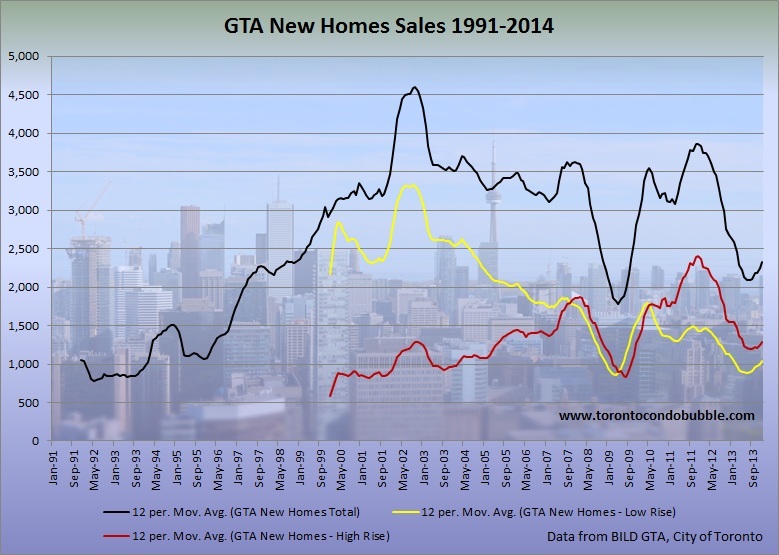 77% of all condos in the GTA were sold within city limits. 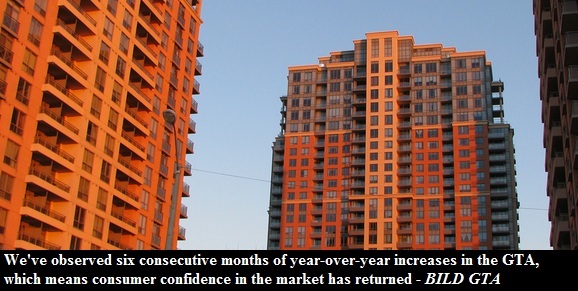 Strongest January ever for new condo sales in the City of Toronto (and GTA)! Chances are that whatever reason you come up with to explain the recent turn around in the pre-construction market is as valid as the weather slowing down the resale market. So beware! Is the condo bubble re-igniting? Who is buying all those condos? Who knows! Only thing I know is that sales have become more volatile. The chart below shows moving averages over 12 months for new home sales by market segment. "The RealNet New Home Price Index identified the average price of single, semi-detached and townhomes as $654,147, up three per cent over January 2013. The price index for the high-rise sector was $436,564 at an increase of one per cent." P.S. In case you didn't hear via Rob Mclister "CMHC will be making an announcement Friday at 11:00 A.M. EST. They’ve notified reporters well in advance, which is somewhat unusual. Twitter is abuzz with speculation on what the announcement might entail. And everyone will have two more days to stew over it."